CNMI Marriage Encounter: Labor for Love Kick Off 2009 on Sep 7th! 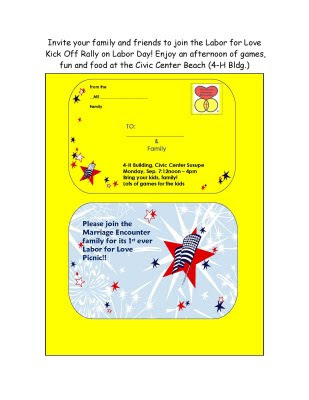 We are also excited to announce that our ME Community will have a family event on Labor Day, Monday, September 7, 2009 - 12 noon to 6pm in and around the 4H Building at Susupe Beach! We've dubbed it the Labor for Love Kick Off 2009 and it promises to be a fun filled bbq picnic type event with games and prizes for our Couples and also for the kids!! We are also opening up this event to any Couples you know who you would like to invite to make the October 2009 Weekend! So dig out that list of Couples you have thought of inviting and ask them to come with you to the Labor of Love fun day! See the attached invitations you can print out to use/share! (You can contact Jenni Aguon at 287-9742 or Kanae Quinn at 285-1168 for more info!) We have also attached a list of what we need to make this event a great success! Please take a look and contact the Aguons or Quinns if you can help out!